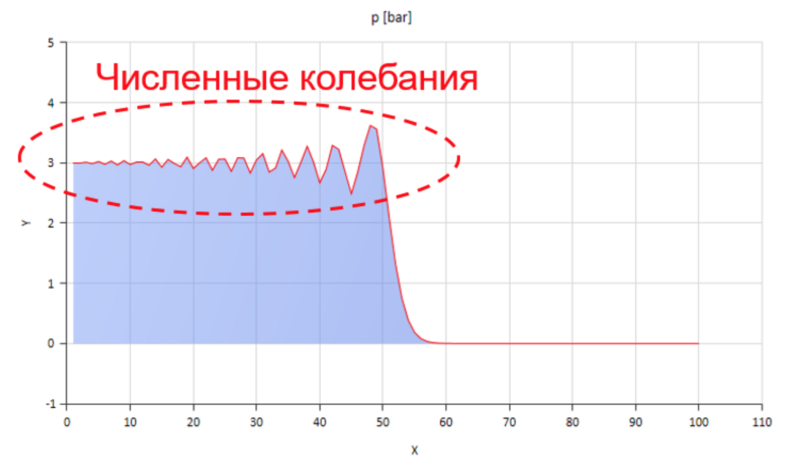 Hello, Habr! In this article, I'll talk about creating a mathematical model of a long pipeline for the SimulationX CAE program in Modelica. We will talk about the calculation of wave processes (pressure pulsations, hydraulic shock, etc.) 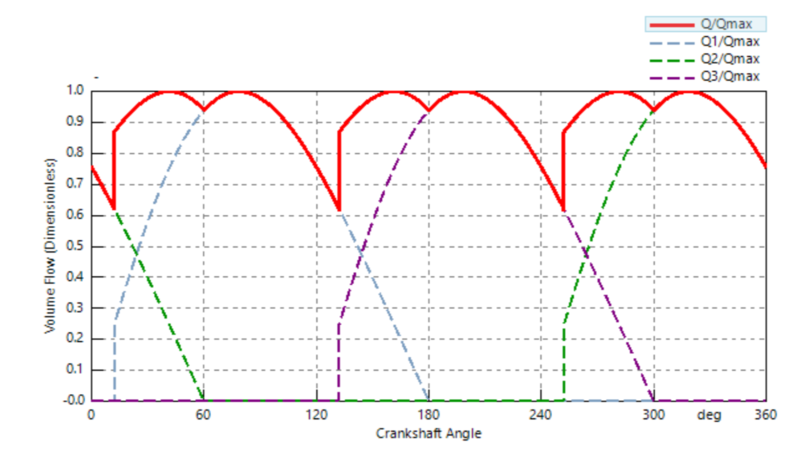 in the hydraulic line by the method of characteristics. Despite the fact that this method is quite old, there is very little information about its application for solving applied problems in runet. Under the cut I will try to explain why we need to take into account the wave processes in the pipelines, highlight the problems that I encountered in programming, and at the end I will compare the process of pressure pulsations during operation of a three-plunger high-pressure water pump for a simple long pipeline in the URACA model and stand. Germany. Hydrodynamic in practice manifests itself, as a rule, at pipeline lengths of 100 meters. At lengths below it is already difficult to find hydraulic equipment, which would have time to close faster than the pressure wave will pass from the gate and back (the condition of the hydrostatic attack). 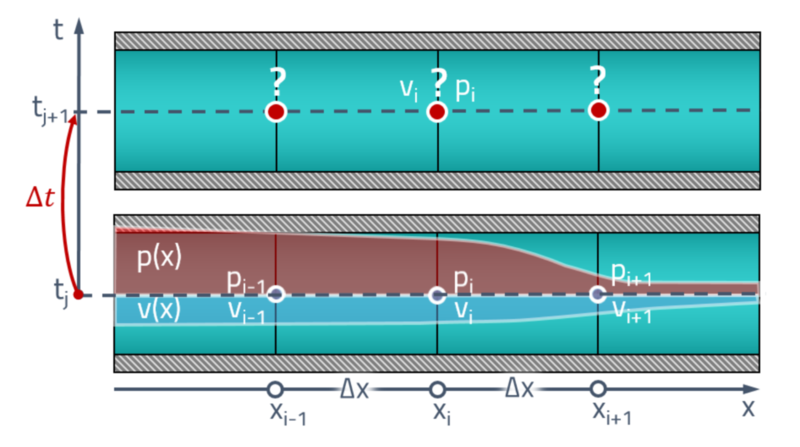 Nevertheless, even relatively short pipelines can still ruin the lives of engineers if there is a source of flow pulsations in the system (for example, a volume pump with a finite number of plungers). The hypha shows the beneficial effect of a piece of pipeline length just a little more than a meter. Its length is equal to a quarter of the wavelength of the pressure, so when it is connected to the main pipeline, a so-called standing wave that, in antiphase, strikes the source of pulsations and suppresses them in this way (this is the so-called quarter-wave pulsation damper). It is clear that in case of an unfortunate coincidence, the effect may be the opposite. In my practice, I tried to wave away from wave processes for a long time. their calculation required a deepening in the matan and numerical methods, to which throughout the study I was treated with condescending disdain. But when one day I saw with my own eyes that the standard advice (to put everywhere RVD, hydraulic accumulator, to organize a support at the pump suction) do not help either to get rid of pulsations at the stand, or, even more so, to understand the ongoing processes, we had to go deeper into matan . Especially to my shame, for me, the scientific advisor of the pipeline model for C ++ has already started to write. - Pressure drop due to gravitational force. Now these equations can be solved as ordinary differential equations, dividing the length of the tube into a set of finite volumes. So this is becomes , for example, in the Simscape package, in MATLAB Simulink, so the problem was solved until recently in SimulationX . 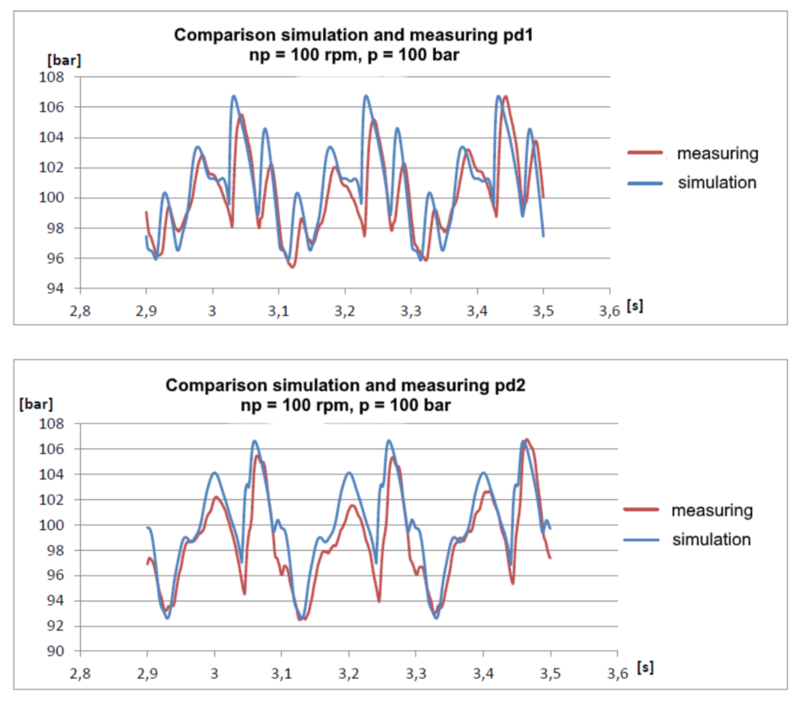 The figure shows the front of the pressure wave moving from left to right. You can deal with these fluctuations, for example, by introducing numerical diffusion, but then the wave propagation velocity is significantly distorted. 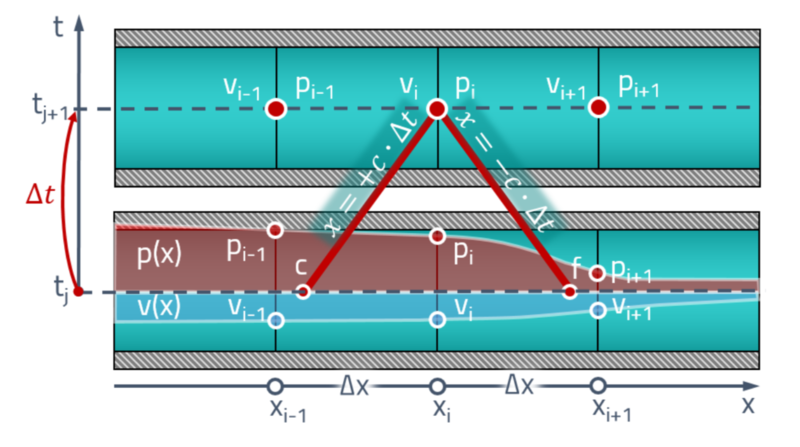 You can increase the friction (especially helping to increase its non-stationary component), but then the model ceases to reflect the physical essence. It is best to use another method of transforming equations in distributed parameters into ordinary differential equations, for example, the method of characteristics. to find such characteristics along which the partial differential equation becomes an ordinary differential equation. Once ordinary differential equations are found, they can be solved along the characteristics and the solution found is transformed into a solution of the original partial differential equation.
. You can solve it numerically, but there is no special problem to get an analytical solution. Then, if we assume the constancy of the speed of sound, we obtain a completely explicit difference scheme. the speed of sound depends on the pressure of the liquid. In this case the characteristics, strictly speaking, will not be straight lines, but in order to find the pressure, one must already know the speed of sound, which depends on this pressure. Those. the scheme will be already implicit. When creating the model, I assumed that the speed of sound varies little from step to step. 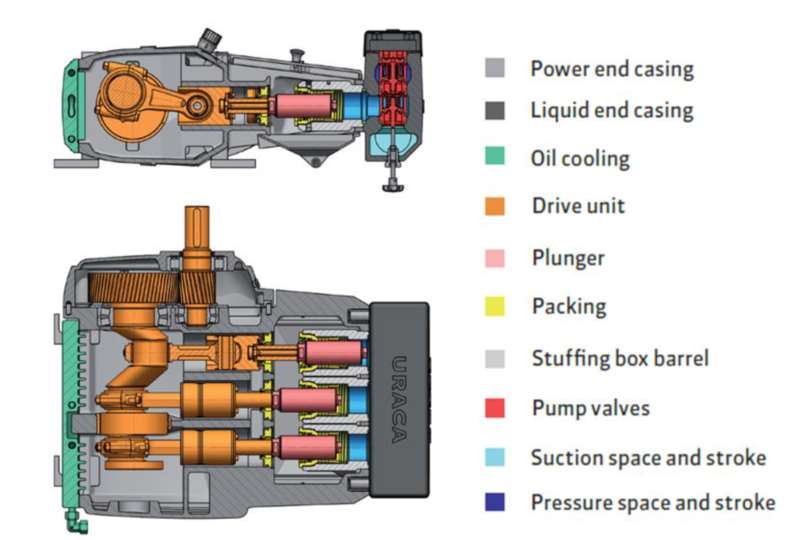 For a liquid this is true in the case of low gas content and in the absence of cavitation. To be sure of the result, the model is best used at pressures of 10 bar. I had the opportunity to finally bring the model to mind when I started working at ESI ITI GmbH in Dresden. One day, I received a ticket in Helpdesk, where the engineers of the firm URACA complained that they could not achieve convergence with experiment with our "old" pipe. 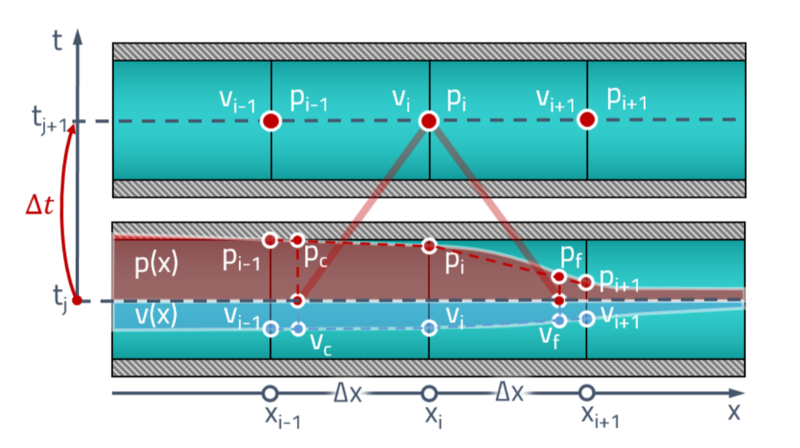 Discontinuities and nonlinearities make it difficult to linearize and analyze the model in the frequency domain, and CFD calculations for such a task are firing from a cannon on sparrows. In addition, they already had models in SimulationX, where they took into account the dynamics of the mechanical part of the pump, the elasticity of the frame, the characteristics of the electric motor, so it would be interesting to see how this will affect the pipeline. There is a simple pipeline with a total length of about 30 meters. At the beginning of the pipeline, a pressure sensor pd1 is installed, at a distance of 22 meters from it there is a pressure sensor pd2. At the end of the pipeline is a valve that adjusts the pressure in the system. 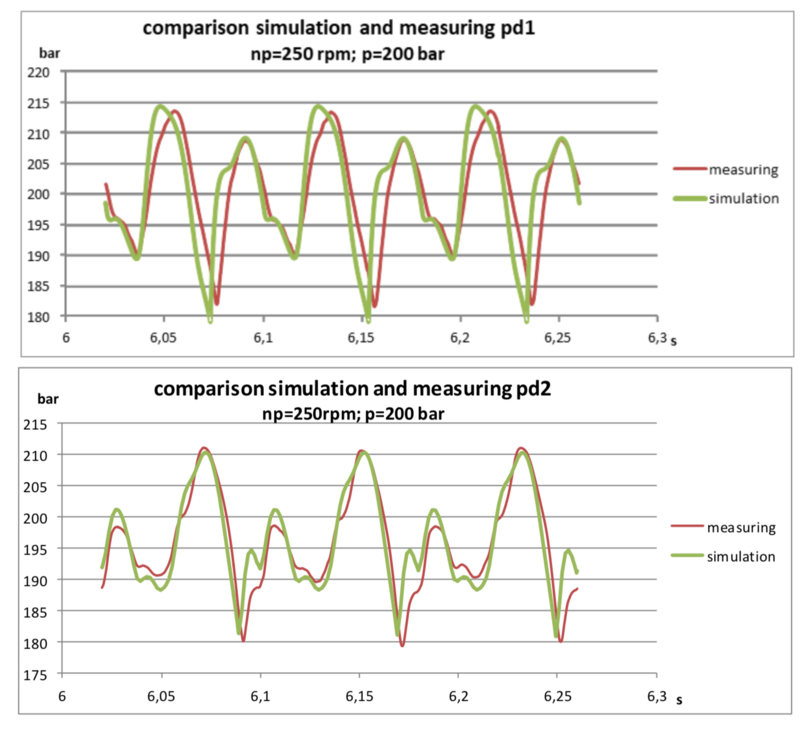 It can be seen that the model is slightly worse than damped, which is understandable, provided that hydraulic resistance is not taken into account in it. Nevertheless, the fundamental harmonics coincide rather well and allow predicting the values ​​of the pressure amplitudes with fairly good accuracy. In the domestic literature, the method of characteristics for engineering applications is best described in book "Hydromechanics", DN Popov, SS Panaiotti, M.V. Ryabinin. I discussed in more detail the problems of joining the method of characteristics and solver of ODE. Who has access to German libraries, the best overview of the methods for solving hyperbolic equations applied to hydraulic lines, which I met, is contained in the following dissertation: Beck, M., Modellierung und Simulation der Wellenbewegung in kavitierenden Hydraulikleitungen, Univ. Stuttgart, Germany, 2003. Classics of the genre according to hyperbolic equations as a whole: Randall J. Leveque, Finite Volume Methods for Hyperbolic Problems, Cambridge University Press, Cambridge, United Kingdom, 2002.